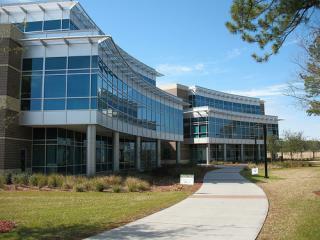 The new College of Education and Human Services building on the University of North Florida campus has been certified LEED (Leadership in Energy & Environmental Design) Gold by the U. S. Green Building Council. It is the first building on the UNF campus to achieve this recognition. The building consists of approximately 107,000 gross square feet on three floors and is located on the West side of the campus core between the Thomas G. Carpenter Library and the recently completed Student Union Building. Interior spaces include teaching labs, faculty offices, meeting rooms and support spaces. The construction cost for this project was $18 million dollars. The University of North Florida's College of Education and Human Services is accredited and approved to award the baccalaureate, masters, and doctor of education degrees, by the National Council for Accreditation of Teacher Education (NCATE), Council for Accreditation of Counseling and Related Educational Programs (CACREP), Council on Education of the Deaf (CED) and the Florida Department of Education (FDOE).